I have now become exclusively preoccupied with a man who -- albeit only in literary form -- has entered my lonely life like a gift from heaven. It is Arthur Schopenhauer, the greatest philosopher since Kant, whose ideas -- as he himself puts it -- he is the first person to think through to their logical conclusion. The German professors have -- very wisely -- ignored him for 40 years; he was recently rediscovered -- to Germany's shame -- by an English critic. What charlatans all these Hegels etc. are beside him! His principal idea, the final denial of the will to live, is of terrible seriousness, but it is uniquely redeeming. Of course it did not strike me as anything new, and nobody can think such a thought if he has not already lived it. But it was this philosopher who first awakened the idea in me with such clarity. When I think back on the storms that have buffeted my heart and on its convulsive efforts to cling to some hope in life -- against my own better judgement -- indeed, now that these storms have swelled so often to the fury of a tempest, -- I have yet found a sedative which has finally helped me to sleep at night: it is the sincere and heartfelt yearning for death: total unconsciousness, complete annihilation, the end of all dreams -- the only ultimate redemption! Without Schopenhauer the creation of Tristan und Isolde and Parsifal is unthinkable, out of the question, for essential to their substance are metaphysical insights which Wagner had indeed absorbed into his living tissue and made authentically his own but which he would have been wholly incapable of arriving at by himself. Several scholars have shown that seeds of the love tragedy theme -- of the profound, often perplexing, Eros renunciation interplay -- were present in Wagner's works long before he had read Schopenhauer, Burnouf or Köppen. Renunciation in one form or another runs through all Wagner's works from The Flying Dutchman to Parsifal. The Dutchman gains redemption, according to Wagner's explanation of the plot, "through a woman who shall sacrifice herself for the love of him. Thus it is the yearning for death that spurs him on to seek this woman." Wagner formulates two different answers to unattainable love: union and fulfilment in death as in Tristan und Isolde, and complete renunciation and union on a higher plane as in Die Sieger. Köppen's account of the Buddha's decision to admit women into the order stressed the Buddha's initial refusal and the role played by Ananda in causing him to reverse that prohibition. Wagner chose to see in this final decision the [final] perfection of the Buddha himself -- the redeemer redeemed -- "one final advance to consummate perfection. Ananda, standing nearer to life as yet, and directly affected by the young Chandala maiden's impetuous love, becomes the medium of this last perfecting". In the words quoted above, written to Mathilde Wesendonk, Wagner means, beyond any doubt, the perfection of wisdom (prajñápáramitá) which his (fictional) Buddha Shakyamuni obtains through compassion for the outcast maiden Prakriti. It is a beautiful feature in the legend, that shows the Victoriously Perfect [ der Siegreich Vollendete ] at last determined to admit the woman. [In the margin:] Love -- Tragedy. Where Schopenhauer advocates withdrawal and non-cooperation in order to impose one's own meaning on the essential meaninglessness of life, Wagner's lovers rush to embrace this will with such abandon and vigour that it is difficult to tell whether the force is overcoming the individuals or the individuals are momentarily mastering the force. 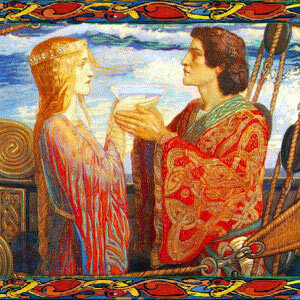 For much of the time when Tristan and Isolde are not narrating or recalling they are gasping their longing for one another. The German word for longing (Sehnen, with a capital as a noun and a small 's' as a verb) provides the focal concept of the Tristan libretto in the same way as Mitleid ('compassion') is the focal concept of the Parsifal libretto; and in each case there is an elaborate substructure underpinning it in the form of Schopenhauer's philosophy, for longing is the key concept of Schopenhauer's metaphysics of existence, and compassion the key concept of his ethics. n what many have regarded as Wagner's most Schopenhauerian work, Tristan und Isolde, the composer worked out his derivative of Schopenhauer's philosophy. Here is the romantic death- wish, again, expanded into a philosophy or even perhaps, as Michael Tanner has suggested, a religion. Although there is no obvious Indian model for any of the text, Isolde's ecstatic transfiguration, with which the work ends, uses (like the 1856 ending of Götterdämmerung) language strongly suggesting the influence of Indian religious literature and Buddhist or Brahmin concepts of deliverance. t is a frequently encountered view of Wagner's engagement with the ideas of Schopenhauer and Indian religion respectively, that sees Tristan und Isolde as the drama most affected by these influences. Even in Guy R. Welbon's study, it is Tristan that is Welbon's focus of attention when he discusses Wagner. Bryan Magee's recent comment, above, redresses the balance. Schopenhauer was equally important as the inspiration for Tristan and for Parsifal, although in the latter case Burnouf and Wolfram too were key elements at the creative moment. As Bryan Magee knows, Schopenhauer insisted that his metaphysics and his ethics were inseparable. It should be noted that the key difference between Tristan and Parsifal is one of emphasis: where the former emphasizes metaphysical ideas, the latter emphasizes ethical ideas. Specifically, those of Schopenhauer's essay On the Basis of Morality, in which, as Magee remarked above, the key concept of his ethics is compassion. t might also be argued that there are no specifically Buddhist ideas in Tristan. Both Günter Lanczkowski and Guy R. Welbon have suggested that there are, while Carl Suneson was sceptical. On internal evidence alone, it is not clear whether either Tristan or Isolde find deliverance at the end of the drama, and perhaps Wagner did not consider the question important. The subject of his Tristan und Isolde is not salvation but the suffering caused by the desire for extinction. Whether that deliverance or extinction takes the form of absorption into Brahman or transition into nirvana is unimportant, in the context of the drama. From a remark that Wagner made to Cosima many years later, that Kundry had undergone Isolde's transfiguration a thousand times, it would appear that he had reached the view that Isolde had not yet escaped from samsara, which in notes in the Brown Book he equated to the realm of day; in contrast, nirvana was the realm of night. So there is sufficient evidence from which to conclude that, if not during the composition of Tristan und Isolde then at least in reflecting on it later, Wagner thought of Tristan yearning for nirvana1, the realm of night. agner's Parsifal deals with (among other Buddhist concepts) samsara (the cycle of rebirth, which can be heard in the music of Kundry) and deliverance or redemption from this cycle of rebirth. In one passage in the second act, after the critical kiss, Kundry and Parsifal speak of desire as burning. In his Fire Sermon the Buddha used burning as a metaphor for suffering. In the most widely accepted etymology of nirvana, the word means blowing out, as in the blowing out of a flame. Therefore, at least on etymological arguments, nirvana is the end of suffering, the blowing out of the flame when it is no longer fuelled by ignorance and desire. In Parsifal there is more than a hint of a sub-text about nirvana. It is difficult to avoid the conclusion that, unlike Isolde, Kundry is released from samsara into nirvana, not by her own efforts but by the intervention of a Bodhisattva, that is, Parsifal. The bodhisattva doctrine includes a description of the transfer of merit [Sanskrit: punya] from a bodhisattva to those in need of help. The being who receives this help is freed from further rebirth and the consequences of their actions in earlier lives, karma, are not brought to maturity but absorbed in the depths of the bodhisattva's boundless sea of mercy. sthoff is surely right when he says of Kundry: her deliverance [Erlösung] is extinction in the Buddhist sense . None of the other commentators on Parsifal have given this sub-text any attention. Reciprocally, it is the compassion awakened in Parsifal by Kundry, in exact analogy to Wagner's treatment of the Buddha and Prakriti, that brings to Parsifal the medium of his last perfecting. n a recently published and thoughtful essay3, Ulrike Kienzle has expressed the view that the realm of night in Tristan und Isolde is equivalent to nirvana (as it was understood by Wagner, that is, the "selige Nichts"). Kienzle points to the entry in the Brown Book, mentioned in my article above, in which Wagner equated nirvana to night and samsara to day. Although Kienzle claims that Isolde enters into nirvana at the end of the opera, this idea is difficult to reconcile with Wagner's statement that Kundry had undergone Isolde's transfiguration a thousand times. Footnote 1: Various recent commentators on Tristan u. Isolde have mentioned that the rising phrase which opens that score was prefigured in an orchestral fantasy by Hans von Bülow which Wagner was studying in October 1854 (see his letter to von Bülow of 26 October), shortly before he made his first sketches for Tristan u. Isolde. The title of the fantasy is Nirwana, opus 20. This shows how ideas about nirvana and samsara were very much current in Wagner's circle of friends and colleagues. Also that these ideas were associated with Tristan u. Isolde from the very beginning. Footnote 2: Suneson's brief discussion of the doctrine of the "transfer of merit" might have been based on his reading of primary sources but it is likely that his main source was the summary of this doctrine in Har Dayal's The Bodhisattva Doctrine in Buddhist Sanskrit Literature, pages 188-193. Wagner probably came across this idea in Köppen's Die Religion des Buddha und ihre Entstehung. According to Dayal, in early Buddhism and contemporary Hinduism (Brahmanism) the doctrine of karma was rigidly interpreted. The consequences of one's karma (actions) led to personal merit or demerit, which according to the Brahmins followed the atman (soul) through successive rebirths. In Buddhism too it was emphasised that the consequences of actions were inescapable; every man or woman reaps as he or she has sown. This idea was used by Wagner in developing his scenarios for Die Sieger (where the one who carries a burden of sin or demerit is Prakriti) and Parsifal (where the one burdened is Kundry) respectively. It was generally regarded as a hard teaching and both in later Buddhism and in Hinduism it was softened. In Maháyána Buddhism the doctrine of "transfer of merit" became widespread and it became one (the seventh) of the páramitás of the advanced Bodhisattva, who willingly gives away the merit that he has earned by his good works for the benefit of others. Footnote 3: Wagner Spectrum: Schwerpunkt 'Wagner und der Buddhismus', 2007, page 47.